Finding great dividend stocks isn't always about searching out the highest dividend yield. Often, especially for retirees seeking a mixture of income and safety, starting out by looking at industry giants is a better approach. And right now, our Motley Fool contributors say there are three big names that should be on your radar. Massive retailer Walmart (NYSE:WMT) has managed to navigate the online threat and is increasingly looking to boost growth in new ways. Biotech giant Gilead Sciences (NASDAQ:GILD) is facing some headwinds but is financially strong and looks increasingly likely to make a big move soon. 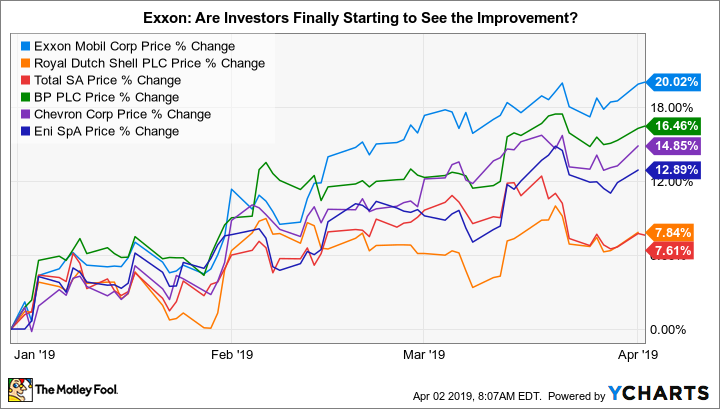 And ExxonMobil (NYSE:XOM), among the largest energy companies in the world, has lagged behind peers in recent years but looks like it has started to catch up. Here's what retirees looking for good dividend stocks need to know to get up to speed on these well-known dividend-paying industry giants. Brian Stoffel (Walmart): Investing legend Peter Lynch said we shouldn't shy away from "buying what we know." In other words, your investments don't have to be complicated. They should be in companies you interact with on a regular basis. Many retirees move to more affordable (read: non-urban-center) areas in their golden years. This makes trips to Walmart to shop -- or, increasingly, to pick up online orders -- more frequent. This should allow such folks to stay familiar with the company long after their working years pass. And that's good news, because its the perfect stock for many retirees. Currently, it offers a 2.2% dividend yield that still has lots of room to grow. Over the past 12 months, the company has brought in $17.4 billion in free cash flow and only used 35% of it to make that payout. That means the dividend both is stable and has lots of room for growth. The company itself is showing strength, too. Walmart's e-commerce operations have done better than even the most optimistic bulls could have imagined. And a stake in India's leading e-commerce player is planting the seeds for huge potential growth in the next decade. Right now, shares are trading for just 16 times trailing free cash flow. Though I don't own shares myself (I'm decades from retirement), that's more than a fair price for a company like Walmart. George Budwell (Gilead Sciences): Biotech giant Gilead Sciences may no longer be a red-hot growth story, but its stock has steadily morphed into a rock-solid dividend growth play over the last few years. Since mid-2015, the biotech's dividend has risen at an annual compound growth rate of 11.6%, despite the company's falling hepatitis C sales and a nearly $12 billion investment in immuno-oncology. Gilead, in kind, has become a dependable income play worthy of consideration by investors with a low threshold for risk. Turning to the details, the biotech sports an attractive yield of almost 4% at current levels and a fairly low payout ratio of 54.6%. Best of all, Gilead's top line should return to positive territory by 2020, which bodes well for the sustainability of the dividend program and its near-term growth prospects. What's the drawback? Gilead arguably needs to acquire more talent to broaden its clinical pipeline -- especially after the recent late-stage failure of selonsertib in nonalcoholic steatohepatitis and the weak commercial performance of its immuno-oncology franchise thus far. The biotech, in turn, might decide to fill this gap through a large acquisition. Unfortunately, dividend programs can be adversely impacted by sizable business-development moves -- and Gilead appears poised to go this route following the installation of new CEO Daniel O'Day earlier this year. On the positive side of the ledger, Gilead has an enormous financial capacity at the moment to pursue deals -- so much so that it would take a large-cap acquisition to even begin to threaten the sustainability of the company's dividend program. In all, Gilead has the pieces in place to be a top dividend play for at least the next decade -- a fact that should appeal to investors on the hunt for a reliable source of passive income. Reuben Gregg Brewer (ExxonMobil Corporation): Exxon's yield is a solid 4%, even after a 20% gain so far in 2019. That stock price advance is better than that of any of its major peers after a long spell of laggard performance. It's a refreshing change for shareholders but also could mean that investors looking to cash in on its historically high dividend yield (the yield hasn't been this high since the mid-1990s) are running out of time. What's going on? For several years, Exxon's production has been falling, which is not a good thing for an oil company. However, despite a year-over-year production decline in 2018, there was a notable shift in the back half of the year -- production increased between the second and third quarters and again between the third and fourth quarters. So while 2018 production looked like yet another negative, there was a clear positive hidden underneath the headline numbers. This is early proof that the company's long-term plans are starting to bear fruit. That improvement, meanwhile, was driven by Exxon's onshore U.S. drilling effort, which is just one of several big investments it has in the works. As the oil giant's offshore drilling and natural gas investments start to come online in the years ahead, the story here will only get better. Which is why now is a great time for retirees to pick up Exxon's historically high yield. The upside potential from its other growth projects is just icing on the cake.